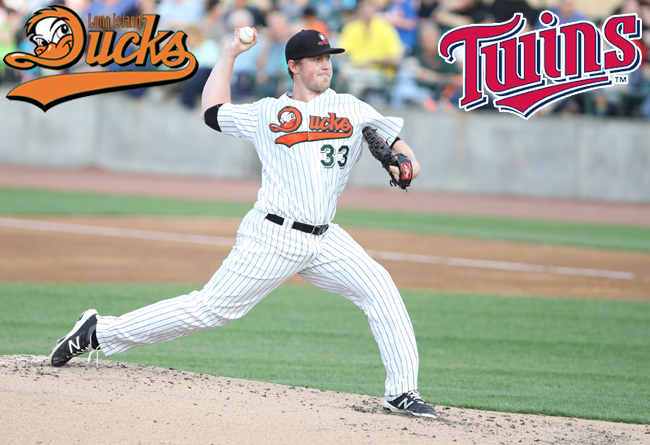 (Central Islip, N.Y., Aug. 21, 2017) – The Long Island Ducks today announced that right-handed pitcher Tim Melville has been called up to the Major Leagues by the Minnesota Twins. He is slated to start for the Twins in Chicago against the White Sox during game one of their doubleheader on Monday. Melville made nine starts with the Flock and compiled a 3-4 record with a 3.44 ERA. In 47 innings of work, the righty struck out 48 batters while walking only 18 and allowing 41 hits. The Virginia resident struck out 14 batters over six scoreless innings in his final start with the Flock, a victory over the New Britain Bees on June 7. The total tied a franchise single-game record, set previously by Mike Loree on September 14, 2011 at Southern Maryland and Rich Hill on August 9, 2015 against Camden. The Twins purchased Melville’s contract on June 10, and he was assigned to the Triple-A Rochester Red Wings of the International League. Since joining the club, he has compiled a 4-3 record with a 2.70 ERA and one complete game in 11 games (10 starts). The 27-year-old has struck out 64 batters while walking just 23 in 66 and two-thirds innings. Highlights have included an 11-strikeout performance over seven innings of one-run ball on July 28 at Toledo and a pair of starts in which he allowed no earned runs in eight innings, taking place July 6 against Pawtucket and July 21 vs. Toledo.